Mercury moves into Aquarius today, and will stay there until February 14th. 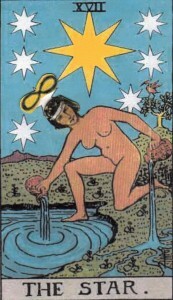 From a Tarot perspective, this transit would be like the Magician is wearing the clothes of the Star. In other words, he’s bare and in the dark. The Magician is a communicator and master of initiation. His clear expression of new ideas is inspirational, and he gets us thinking like few can. His world is one of big concepts and pure ideals. And his dreams are fresh and unsullied by the intrusion of practical details. It’s the Magician’s determined will and unflinching focus that gets things started. And all the tools of life are at his command. The Star is much more quiet. Her communication is subtle, dreamy, and less intellectual than emotional. After times of chaos or shattered hope, she inspires us to renew and refresh. Her soothing presence can heal with just a wish. The Star hides nothing, though her language is often one of symbols. She stirs up the unconscious to let us dream again. The Magician isn’t used to being quite so gentle, but he’s happy to turn his attention to bringing a quiet light to the dark. Mercury in Aquarius, or the Magician dressed as the Star, can be a time of focused rejuvenation and empathetic communication. It’s safe now to share your feelings, hopes, and sadnesses. And if doubt and confusion have created a stalemate, or a climate of distrust, you might soon start to feel a more easy flow, and reason for optimism. Be open with your heart, and unafraid to speak with love. A few kind words can change everything. You are currently reading Mercury in Aquarius – Magician Dressed as the Star at The Tarot Room.